A number of plants share its common name, so it's important to specify the taxonomy of Italian bugloss to avoid confusion. Its botanical name is Anchusa azurea. I grow the 'Dropmore' cultivar, and, unless otherwise stated, it is to that cultivar that I refer to the information below. Anchusa azurea 'Dropmore' is a herbaceous perennial. It is, however, a short-lived perennial, being a rather fussy plant to grow (see below under Growing Conditions, Caveats) and prone to dying prematurely. Consequently, many gardeners treat it as a biennial. Frankly, the plant is so pretty and so unusual that I would still choose to grow it even if I had to treat it as if it were an annual. 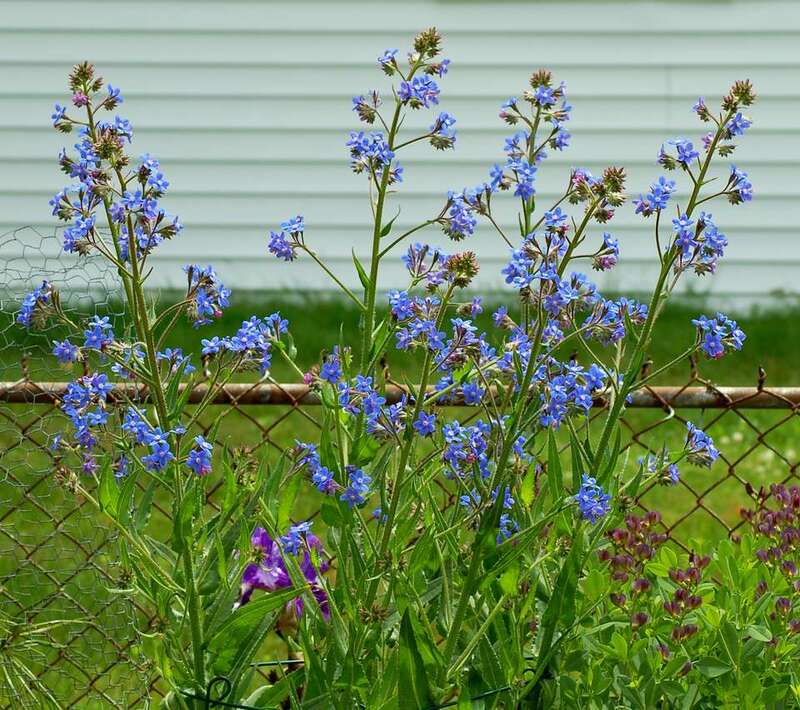 Italian bugloss stands 4-5 feet tall at maturity, with a spread about 1/2 that. It initially blooms in my zone-5 garden in late May or early June. The flowers resemble those of forget-me-not (Myosotis), to which it is related. Simply to state, however, that Anchusa azurea 'Dropmore' has true-blue flowers is to ignore the complexity of the blooming pattern, which I find intriguing. Each blossom-to-be begins with a pinkish bud that opens to become a pink-lavender flower; only later does it turn blue. Because not all the flowers open at the same time, you'll have some of the pink-lavender blooms around at the same time as others are sporting their blue duds (see picture). In essence, then, the blooming display is bicolored. You may be familiar with this pattern through another relative of Italian bugloss, namely, lungwort (Pulmonaria). But because Anchusa azurea 'Dropmore' is such a tall perennial, the effect is even more striking. Italian bugloss is in the borage family. It is related to several plants with which you may be more familiar, beginning with borage, itself (i.e., the herb, Borago officinalis, which tastes a bit like cucumber). Indeed, the hairy foliage of Anchusa azurea 'Dropmore' will very much remind you of borage. Anchusa azurea 'Dropmore' is listed for growing zones 3-10. Place Italian bugloss in full sun and a well-drained soil. The latter stipulation is very important. It is a Mediterranean native, so it needs to be planted in ground that drains sharply, else it will meet an untimely demise at the hands of rot. In this regard, treat it as you would a perennial such as lamb's ears or a herb such as lavender. That fact may give the plant a reputation for being hard to grow. Nonetheless, it is also true that this tall perennial (the species plant, at least, if not the cultivar) is considered an invasive in some regions. "How can so fussy a plant be invasive?" you may ask. Well, it's the fact that it can reseed that makes it potentially invasive. If this is a known problem where you live, you can solve it by deadheading. The plant is famous (or infamous, depending on your point of view) for drawing bees. If you're allergic to bee stings, you may wish to avoid planting it near your patio, for example. Furthermore, the bristly texture of the vegetation can irritate some people's skin upon contact. Mulch in winter. Again, though, being mindful of the plant's susceptibility to rotting, avoid covering the crown with mulch. I like the leaves of this plant early in the season, but after it's done blooming and has been pummeled by the summer's heat for a while, the foliage tends to become ratty looking. Consequently, some growers cut it down to the ground after blooming. Since this tall perennial has a tendency to flop over, provide it with a means of support (stakes, plant rings, etc.). The primary common names ("Italian alkanet" being the less used of the two) are hardly melodic and do nothing to promote the use of this fine plant in the landscaping world. "Bugloss," it turns out, has nothing whatsoever to do with bugs. Instead, the name derives from the Greek and translates as "ox tongue" (apparently due to the "roughness and shape of the leaves," according to Botanical.com). Since Italian bugloss is a showy plant, you might be tempted to use it as a specimen. But due to the foliar deterioration during the summer mentioned above, it wouldn't be a long-term candidate for this role. Instead, when deciding on a landscaping use for this plant, I recommend taking advantage of one of those defining characteristics I mentioned above: namely, its height. Such a tall perennial can serve you best in the back row of a flower border. Which Perennials are the Most Drought-Tolerant? Is There a Salvia That's True Blue? Don't Be Without David for Another Summer! What Perennial Is Tall, Dark and Handsome?